This species has unique body patterning within the genus (see 'notes'). 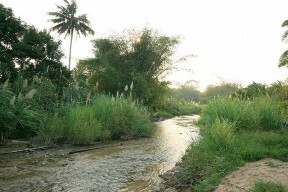 Habitat in Surathani province, southern Thailand. 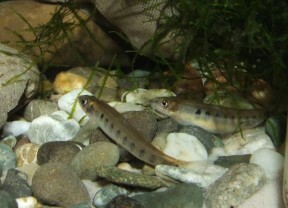 Adult pair in the aquarium, female left. 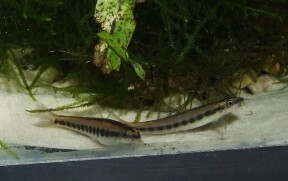 The same pair during a presumed courtship event showing much paler patterning. Wild specimen in its natural habitat, Surathani province, Thailand. Well-conditioned individual in the aquarium. Nemacheilus: from the Greek nēma, meaning ‘thread’ or ‘filament’ and cheilos, meaning ‘lip’ in reference to the furrowed lip in members of this genus. ornatus: from the Latin ornatus, meaning ‘ornate, embellished’. Known only from the Tapi river drainage in Surat Thani province, southern Thailand with type locality ‘Lake Sonkphan, Khlong Sok at Ban Khlong Sok, 8°49’N, 98°35’E, Tapi River basin, Surat Thani Province, Thailand’. The Tapi originates in neighbouring Nakhon Si Thammarat province but there are no reports of this species occurring there. 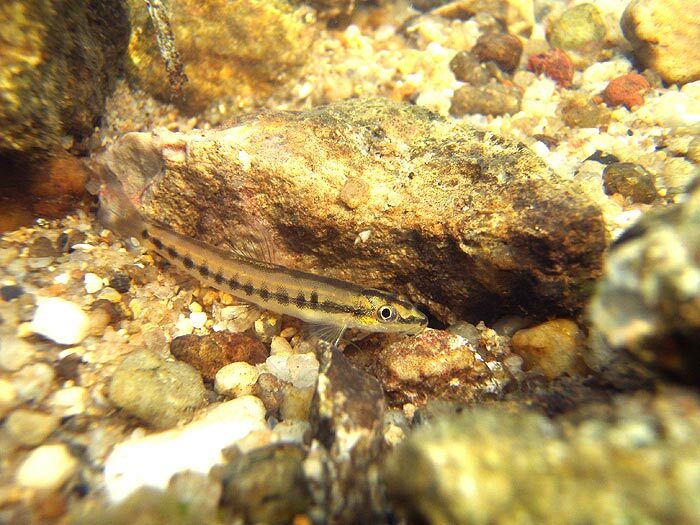 Said to occur in shallow riffles with substrates of small pebbles and clear, moderately-flowing water. At one locality in the Tapi basin in Khlong Sok sub-district, Surat Thani, syntopic species included Acanthocobitis zonalternans, Schistura geisleri, Homaloptera smithi, H. ogilviei, Amblyceps mangois and Akysis hendricksoni. Not difficult to maintain under the correct conditions; we strongly recommend keeping it in a tank designed to resemble a flowing stream or river with a substrate of variably-sized rocks, sand, fine gravel, and some water-worn boulders. This can be further furnished with driftwood branches arranged to form a network of nooks, crannies, and shaded spots, thus providing broken lines of sight. While the majority of aquatic plants will fail to thrive in such surroundings hardy types such as Microsorum, Bolbitis, or Anubias spp. can be grown attached to the décor. Though torrent-like conditions are unnecessary it does best if there is a high proportion of dissolved oxygen and some water movement in the tank meaning power filter(s), additional powerhead(s), or airstone(s) should be employed as necessary. Nemacheilus species are omnivorous although the bulk of their diet consists of small insects, worms, crustaceans and other zooplankton with only relatively small amounts of plant matter consumed, mostly via the stomach contents of prey items. In the aquarium they will accept dried foods of a suitable size but should not be fed these exclusively. Daily meals of small live and frozen fare such as Daphnia, Artemia, bloodworm, etc., will result in the best colouration and condition. Fishes which inhabit similar biotopes in nature constitute the best options, especially peaceful, open water-dwelling cyprinids since the presence of one or two schools can make a visible difference to the confidence of this naturally reclusive loach. 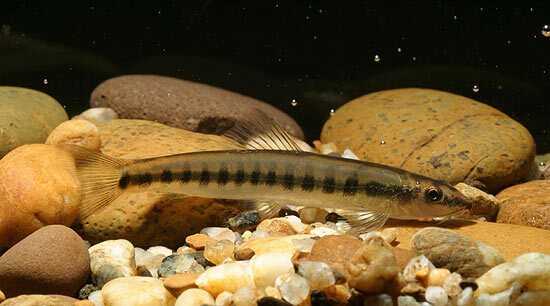 Other possibilities include rheophilic loaches from genera such as Gastromyzon, Pseudogastromyzon, Beaufortia, and Sewellia, plus benthic cyprinids like Crossocheilus and Garra species. Some similarly-shaped relatives such as other Nemacheilus, Acanthocobitis, and Schistura spp. are excessively territorial or otherwise aggressive, although a combination may work in larger aquaria. This species is peaceful with conspecifics and seems to appreciate being maintained in a group so the purchase of four or more specimens is highly recommended. Males possess a suborbital flap, and the first four branched pectoral-fin rays are thickened with 3-4 rows of tubercules on the upper surface. These may become thicker/greater in number respectively when the fish are in breeding condition. Adult females are likely to be slightly larger and heavier-bodied than males. This species is distinguished from similar-looking congeners such as N. longistriatus and N. ornatus by its unique colour pattern consisting of a black lateral body stripe with 9-16 vertically-orientated blotches extending along it both above and below, plus an irregular stripe running along the dorsal surface. The anterior lateral blotch is surrounded by lighter pigment, forming an ocellus similar to that seen in N. binotatus. Following Kottelat (1990) the genus Nemacheilus is characterised by a combination of characters as follows: elongate body; complete lateral line; presence of enlarged scales above and below the lateral line in some species; caudal-fin forked to deeply forked with enlarged upper lobe; large eye; small, strongly arched mouth; lips usually thin; usually no median interruption in upper lip; upper jaw with processus dentiformis (a tooth-like projection); no median notch in lower jaw; long barbels; males usually with suborbital flap, pectoral-fin rays 2-6 thickened and with rows of tubercules.